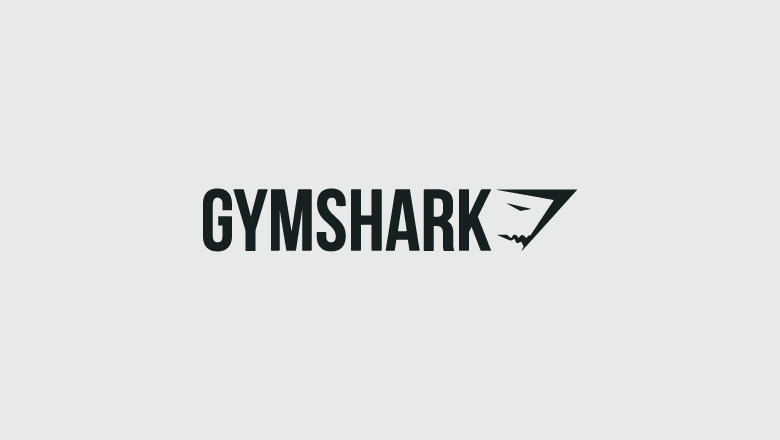 Elfried Samba, Head of Digital Community, Gymshark: Gymshark is a fitness clothing ecommerce brand, and basically what we do is provide fitness clothing for people to reach their full incredible potential. We ship to over 130 countries and we have a really big social media community. Engagement is a big factor because that literally gives us a representation of how our community are accepting the content ideas that we’re creating. So that’s the number one thing. We look at the growth rate of our followers as well to understand how many new potential customers that we’re building in. We’re also looking at things like shares, mentions, what’s our influence in the wider side of things. We want to start to get the Gymshark brand out. Liz Bate, Digital Community Manager, Gymshark: The most highlighted channel at the moment is Instagram. So we have 1.8 million followers on our main account, and 850,000 currently on our Gymshark Women account. Being able to use Simply Measured to look at the analytics behind both those channels is really important. Elfried Samba: One of the things we used to do all the time was ‘Instagram is our main focus’ and then everything else was basically a version of what we did on Instagram. And now what we want to identify is how we give each platform its own voice, and to be able to do that we actually had to start from scratch. Liz Bate: We might see fans react differently to a campaign on Twitter than to the same campaign on Instagram. 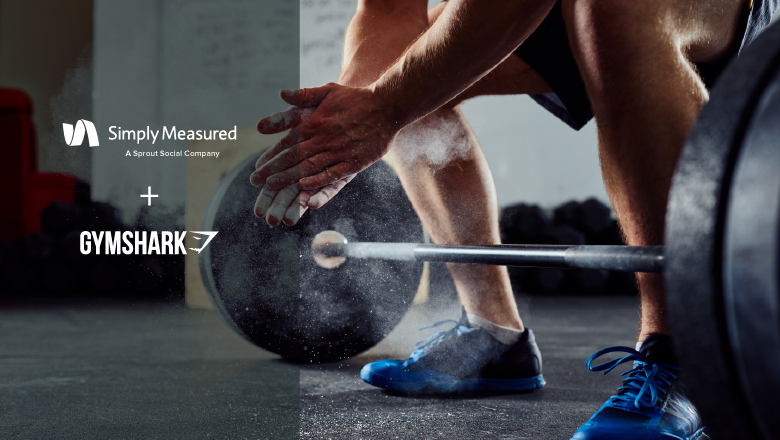 By using Simply Measured, we can see what our tone of voice needs to be on each channel and make sure we’re delivering the right message – wording it in a way that those fans want to see it or read it. Elfried Samba: For example, things like Pinterest, when I started, had 0 followers, then within a year had 400 followers, but now we’re just shy of 14,000 followers simply because we understood what the audience is actually interacting with. 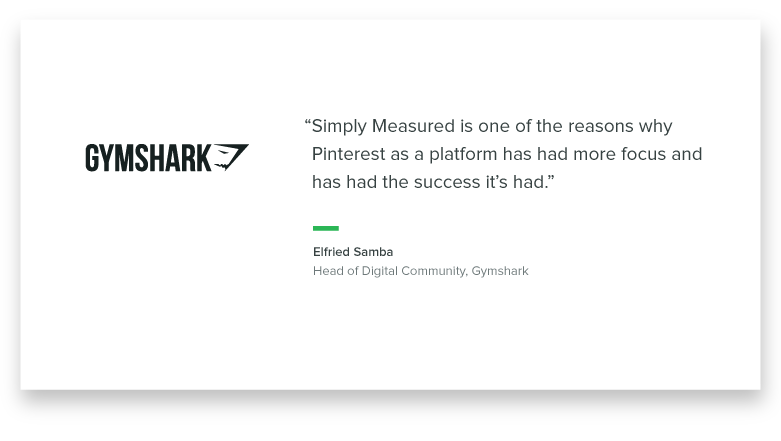 Simply Measured is one of the reasons why Pinterest as a platform has had more focus and has had the success that it’s had. Liz Bate: The way the tool has impacted the strategy is looking at the information and reading it really closely so we’re able to literally go through and see what’s worked very well. So we can look at campaigns that had a really good reaction with fans, and then we can look at what element of that campaign we can use in the next campaign to make that a success as well. Elfried Samba: The mechanism behind what drives that data is really, really phenomenal. However, from the outside it’s really easy to understand and literally we’re able to get other departments from the organizations using Simply Measured just because it was that easy for them to do it. Liz Bate: The biggest problem we have in the digital communities team is time, so we need to be able to make sure we are communicating to fans each campaign and each new release. Using Simply Measured to really help us with time and have all our reporting in one space was really important for us. Elfried Samba: You don’t want to be caught up in admin. So you want to make sure that you’re maximizing your time working on what it is you want to do, which is the content side of things. And then based on what you’re doing, something in the background is basically gathering all the insights that you need. The biggest change is all about efficiency. It’s all about saving our time, making sure that we maximize on what it is that we’re actually doing, and letting Simply Measured do the analytics for us. Liz Bate: By using Simply Measured, you can save a lot of time, and you can see the overall social media strategy and how well it’s working. Elfried Samba: What are you waiting for?